Our aim is to provide a lifestyle for our residents, which meets their social, cultural, religious and recreational interests and needs. We encourage residents to maintain old friendships and build new ones. 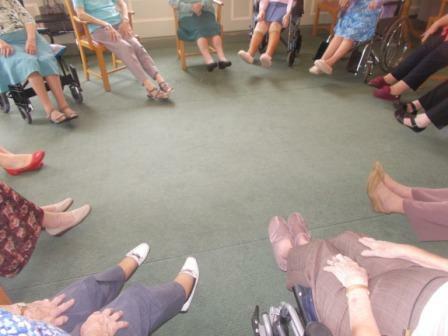 Programmes of activity are designed to encourage mental alertness, self-esteem, and social interaction with other residents. We will seek to maximise development of individuals within their potential and encourage them to express themselves as unique persons. When we can we like to take our residents on trips out and about, locally and further a field, we even have our very own mini bus especially for such occasions! Past trips include to the park, the theatre, and the seaside, and for those need to stay close to home the seaside has been known to come to us!!! Family and friends are always welcome to join in with our events and activities programme, we also have a dedicated public event calendar for our main fundraising activities. ﻿See our﻿ Date's for your Diary pages for a list of upcoming public fundraising events. Residents are given the choice of what activities they wish to join in with and when to take free time. They have the opportunity to give input on what entertainment and activities they wish to be arranged through quality assurance questionnaires and by being on the Entertainment Committee. Monthly newsletters, notice boards, and visual pictures / signs are used throughout the home to assist individuals that may experience communication difficulties. Residents of the sheltered housing are encouraged to join in with social activities held in the care home. Any excuse for a tea party and with Chefs famous cream teas you can't go far wrong! Whether it a birthday celebration, a national event or just for fun we hold numerous tea parties throughout the year, it's a great chance to socialise and make new friends!